William Lynch has been a freelance writer for the past fifteen years, working for various web sites and publications. He is currently enrolled in a Master of Arts program in writing popular fiction at Seton Hill University. He hopes to one day become a mystery novelist. 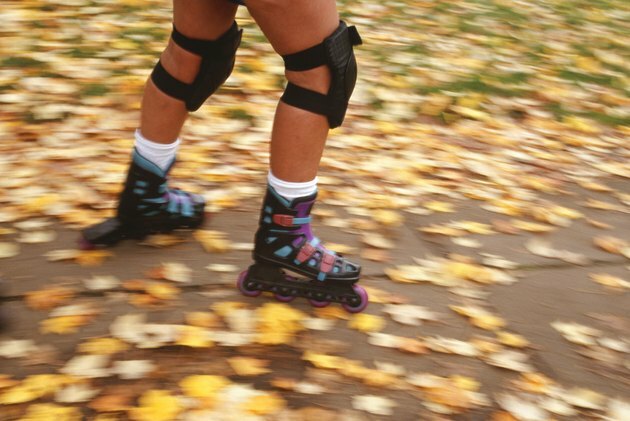 Inline skating, also known as rollerblading, can be great exercise, not to mention a chance for artistic expression. Even beginners can learn a few simple tricks to bring some added flair to their skating. Of course, make sure to wear a helmet, elbow pads and knee pads before attempting any new maneuvers. In a heel-toe trick, the skater glides along on the front toe of one skate and the back heel of the other. While it may look spectacular, the heel-toe is actually easy to perform. Keep your weight evenly balanced on both skates and your feet scissored, with one foot slightly ahead of the other. Now straighten that front leg so the skate's toes naturally elevate, leaving only the heel wheel on the ground. While continuing to glide, bend your back leg and push the rear foot backward until the rear wheels elevate, leaving only the toe wheel in contact with the ground. Also known as a windmill or drunken man, the barrel roll involves a step sequence combined with a body rotation to create a spinning circle maneuver. To begin the step sequence, push forward on your left skate and then your right skate to build speed. While continuing to glide forward, rotate your upper body counter-clockwise while pulling your left skate backwards so it is pointing heel to heel. Transition your weight to the left skate while lifting your right skate. This will have you skating backwards. Now, while still turning your upper body, place the right skate down. Repeat the original transition, pulling the left skate backwards heel to heel, to turn forward and complete the barrel roll spin. A simple fishtail maneuver can add a little wiggle to an otherwise dull skating path. To perform a fishtail, build up some speed and allow your trailing skate to wiggle on its toe wheel. Moving the rear skate in and out completes the trick. Applying more weight to the toe wheel can steer the movements into a wider arc. The easiest spin to master, the flat spin begins with the feet evenly balanced and shoulder width apart. Twist the upper body in the direction you want to spin. This will naturally cause the lower torso to follow, allowing you to perform a 180 or 360 spin. When twisting the upper torso, keep the movement slow and smooth. Twisting too quickly may throw you off balance. The forward moving skate, or the outside skate in the spin, always acts as the pivot point for the spin, while the inner skate serves to provide stability.